At one time the community of Frankford was here. White Rock Creek is just to the east. The cemetery is now in the middle of the Bent Tree North subdivision. It is on the same land as the Church of the Holy Communion of Frankford, Episcopal. This was originally a Methodist church. The long wooden building in the middle is the old Addison train station. Both the [Frankford] church and [Frankford] cemetery have historical markers. According to the historical marker, the cemetery has been associated with the White Rock Masonic Lodge, No. 234, since the 1870's. Lodge members served on the Cemetery Association Board. The cemetery is no longer associated with the Masonic Lodge. This cemetery has an active Cemetery Association. The cemetery is still in use. There are deeds listed in Vol W, p 502 & 503. This summary was written in 1992. Certain information in the entry in this book for the Frankford cemetery was erroneous or has changed. The cemetery association has requested that the information be removed and updated. HERE. THE EARLIEST MARKED GRAVE IS THAT OF JOHN T.
SERVE ON THE CEMETERY ASSOCIATION BOARD. The oldest unmarked grave that is known is that of Eliga M. Yaeger, who died at his home in Lebanon on August 27, 1862. His family was unsuccessful in trying to locate his grave, but the date was substantiated by family Bible records. The earliest death date is that of John T. Coit, born in Cheraw, South Carolina on July 6, 1829. John Coit was a Princeton graduate and became a lawyer in his hometown. He married Catherine Mallow Bunting on January 2, 1856. In the spring of 1858 he left his home in South Carolina and went prospecting for land. He found what he wanted on the Collin County /Dallas line and bought 320 acres from L. W. Coleman five miles west of Plano. He contracted with J. M. Huffman to build a house. John and Cattie arrived in Texas in 1859. At the opening of the Civil War, he raised a regiment in and around Dallas and served with distinction as a colonel of this organization. After the war he practiced law in Dallas. Cattie taught school. The couple had three children. Coit Road is named for the family. John died on March 2, 1872. The Coit papers state that his body was originally buried in a little cemetery on the bluff above the river (Trinity?) [sic] but was later moved to Frankford where his children attended school and where the family was buried. Consequently the first burial which resulted in a marked grave at the Frankford Cemetery is actually that of Margaret McKamy. She was born November 4, 1786 and died November 5, 1873. Margaret was a daughter of George Townsley of Pennsylvania and was of Irish descent. She married William C. McKamy, a native of Virginia and a saddler by trade. His husband died in 1845 and in 1851 she came to Texas with her son William C. McKamy from Roan County, Tennessee. Her son William bought the home and substantial mill on White Rock Creek in Dallas County from the Peters Colonists, Jack and Tom Mounts. He and his young wife, Rachel, took possession of the home and property and began to improve it. He was very successful in the business of farming and stock raising and soon accumulated a large landed estate. Mr. William C. Furneaux, 93, of Carrollton, went to school at The Hall in 1875 when W. H. Alexander and his wife taught about 75 pupils there. His sister-in-law, Mrs. Joe Furneaux of Dallas, then Carrie Murphy, went to school there at that time. Capt. McKamy was buried there in 1902; his mother, Mrs. Margaret McKamy, born in 1786, was buried there in 1873. 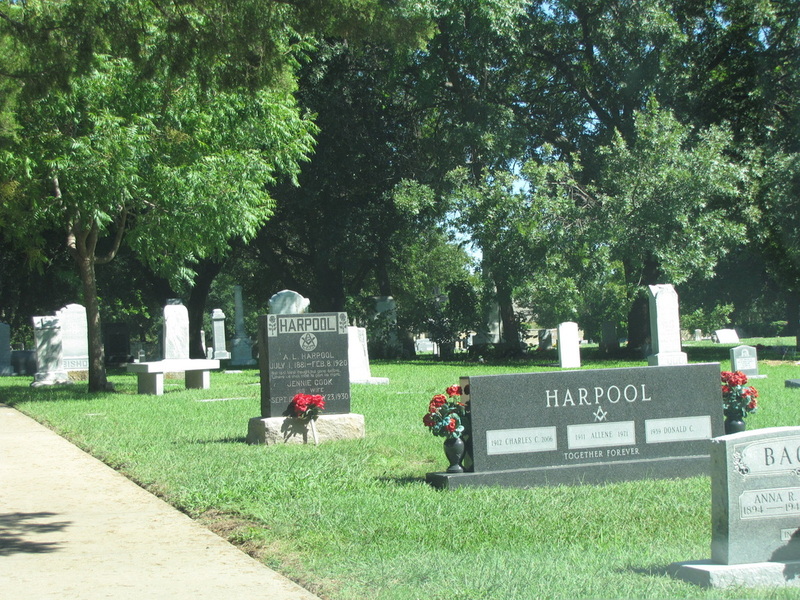 Two Peters Colonists, Lionel Simpson, who emigrated from England in 1848, and Mrs. W. H. Alexander, are buried there. The two men honored by the twice-named town of Addison: Sidney Noell, who donated the land for Noell Junction, as Addison was first called; and Ad Robertson, a well-known resident of the community, are buried at Frankford. John F. Dickerson, donor of half of the townsite of Renner, is another pioneer buried there. The Frankford site consists of Frankford Cemetery and Church and the surrounding grounds, a total of about eleven acres. The first known burial dates to 1862. The current Frankford Church was built in the 1890s after an earlier one was destroyed by a tornado. The White Rock Masonic Lodge played an important role in the daily life of Frankford from the 1872 to 1907 when it was moved to Addison. The lodge building served as church, school and social center and stood on what is now the northwest corner of Frankford Cemetery. In 1948 Frankford Cemetery Association was incorporated as a cemetery company to oversee cemetery lot sales and burials. The core group of original cemetery association members were descendants of early settlers buried at Frankford. In 2010 the Frankford Cemetery board of directors completed a careful restoration of the historic Frankford Church. During the church restoration project a landscape architect discovered a three-acre remnant of the Blackland Prairie. This area between the church and cemetery had never been plowed, only mowed sporadically through the years. The association stopped mowing the grasses and soon native plants like big blue stem, little blue stem and side-oats grama sprang up. Soon thereafter, the FCA board authorized the restoration of Indian Springs which immediately began flowing again after being capped off since the 1930s. 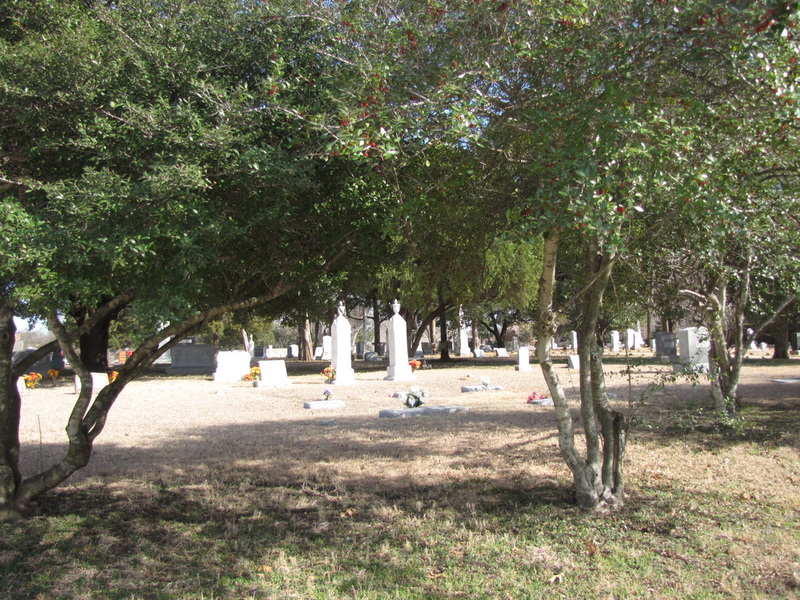 Today, Frankford Cemetery Association and Frankford Preservation Foundation work closely together to maintain the unique Frankford site in Collin County. The two organizations remain committed to carefully maintaining this special site for the benefit of future and present Collin County and Dallas residents and all those who want to learn and experience North Texas history.